According to tradition, Squanto was an English-speaking Native American who proved invaluable to the survival of the Pilgrims, teaching them the ways of the Native Americans, and translating for them. It was with his help that Thanksgiving between the Pilgrims and Indians first came to pass. The truth, however, is much spottier: Squanto was captured by British slave traders in 1614, then sold as a slave in Spain. He escaped to England before making his way back to Cape Cod in 1619. His home village of Patuxet had been wiped-out by disease. There were 35 Pilgrims among the Mayflower's 102 passengers, and Squanto taught them to cultivate corn, and where to hunt and fish. The Indians celebrated an autumnal feast, and it is probable that they invited the Pilgrims to attend, but the Pilgrims held no such observance. Pilgrims did not become part of the traditional Thanksgiving myth until the 1890s. President Abraham Lincoln set aside Thanksgiving as a national holiday in 1863, specifically to create unity in a divided nation. 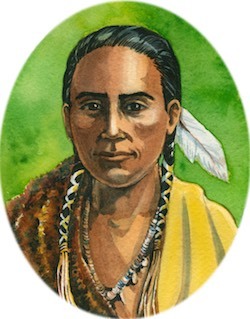 Squanto, or Tisquantum, is believed to have died in 1622.